Many types of grass prefer sunny areas with well-drained soil. These sun-loving varieties often suffer and die in shady areas of the lawn. Select grass types that tolerate shady and wet conditions to plant under trees or near structures that block sunlight. Choose the best grass seeds to plant in shaded areas within your landscape or yard by considering individual grass characteristics, as well as site requirements. Bahia grass thrives in tropical and subtropical climates. Displaying a strong tolerance towards salty soils, this type of grass seed establishes quickly and easily in damp, shady locations. It withstands sustained floods of up to six days at a time. Although this grass thrives in damp conditions, it tolerates occasional periods of drought. Due to its aggressive habit, Bahia grass requires containment to avoid spreading. Hawaiians use this crop to provide forage for livestock and prevent against erosion along streams and roads. Perennial ryegrass seed grows well in shady areas with wet soil. 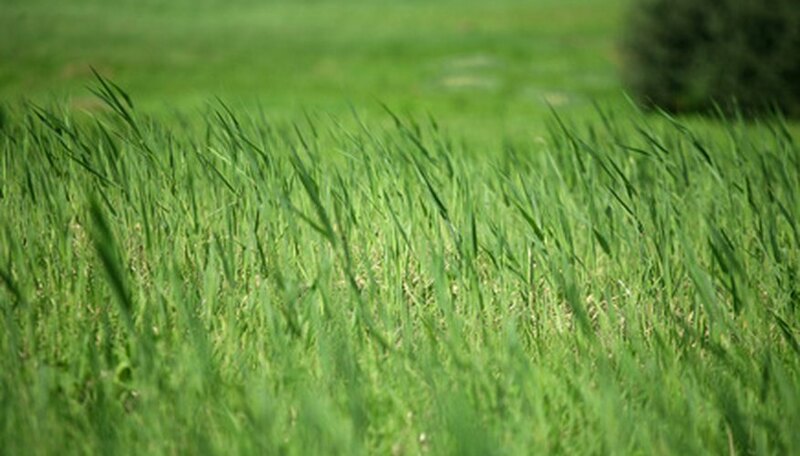 Perennial ryegrass includes several different varieties, such as Palmer, Pennant, Regal, Gator, Cowboy, Elka and Repell. Many types of commercial grass seed blends contain a percentage of perennial ryegrass seeds. Avoid damaging this grass by limiting excessive amounts of traffic. This perennial type of grass provides a quick solution in shady areas but thins out rapidly after about a year. This type of grass grows easily in shady conditions with cool, wet environments. The soft leaves of this light green grass add interest in yards and landscapes. It thrives in the spring and fall, but tends to die back during dry conditions in the summer. This spreading grass requires containment to keep it from becoming invasive near other types of plants. The grass' spreading habit creates patchy areas in areas with minimal amounts of shade. This is a good grass to plant in lawns with several trees and a previous history of unsuccessful grass plants.